Back in September, after I had returned from holiday, I felt the need to do something that would encourage me to be more active. Everything seemed like such a massive effort until I stopped with the All-or-Nothing thinking that I'm so prone to doing and came up with my own little squat challenge. The next day I got out of bed and did one squat. Just the one. I can't express how silly I felt doing just one squat. It needed to be bigger, more perfect somehow? Or maybe a nice round number like 10 or 500. 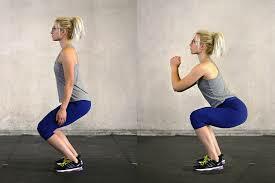 There are lots of people out there that do heaps of squats every day. I gently reminded myself that my purpose was to start small, get rid of the perfectionism and the go big or go home attitude that's stopping me from doing anything. The next day I did 2, then 3, and so on. I didn't miss a single day and increased by one every day. The first couple of weeks went by no problems and I focused on quality. By the third week I was finding that I was starting to breath heavier towards the end of the set. Sometimes I found myself pausing before completing the set but the next day or so I was going longer without needing to pause. I had started this challenge without an end point and was starting to get bored. I added in more things like sit-ups and press-ups to shake it up a bit but I wasn't feeling it. After 6 weeks I decided to call it a day. I felt good about what I had achieved and I was being more active in my everyday life again. At the time, I wasn't seeing or feeling any benefits from the squats but then I noticed that I felt stronger when doing crossovers in figure skating. Now I'm thinking about other things that I can start small with and build up over a 6 week period. I might even do this same squat challenge again but add in a weight. Or do single leg lunges (haha no). This reminds me that I put squats at my monthly goal list. Haven't done a single one yet - oops.